The retail box of the Sony Xperia SL features the familiar GreenHeart charger, which pairs with the microUSB cable to charge the phone. An in-ear headset is also available, which rounds up all the essentials, as the Xperia SL has no card slot. The only difference over the Xperia S box is the lack of Smart Tags. The Sony Xperia SL still features NFC connectivity, and you can always download the SmartTag app off the Google Play store, but if you are after the Smart Tags functionality, you'll have to purchase them separately. The Sony Mobile official store offers a bundle of four tags in different colors for $20, in case you were wondering. You may even be able to get cheaper offers on Ebay, the tags are universal and don't have to be branded by Sony to work with the Xperia SL. The Sony Xperia SL has the exact same measures as the Sony Xperia S - 128 x 64 x 10.6 mm. Considering that the Motorola RAZR M stands at the impressive 122.5 x 60.9 x 8.3, while touting an identically sized screen and a larger, 2000 mAh battery, the Xperia SL may certainly be considered a bulky smartphone. The Xperia SL is also quite heavy, tipping the scales at 144g. It's no Nokia Lumia 920, but it certainly won't let you forget that it's in your pocket. On the other hand, the relatively heavy weight contributes to a very solid feel, when you hold the Xperia SL in your hand. The Sony Xperia SL design is perfectly identical to that of the Sony Xperia S.It's not a new design, but we still like the combination of square angles and curves. The design has carried over the unique accent too, in the illuminated transparent strip. In this day it's not that easy to find a smartphone which has as much character as the Xperia SL. It might have led to an increase in the overall volume, but it's probably worth it. After all, the Sony smartphone doesn't have a screen nearing 5" in size to worry about so it can afford to spare a few millimeters for a good cause like that. Above the screen sits the earpiece, alongside the 1.3MP front-facing camera, which can record 720p video. The proximity and ambient light sensors are here too, and there's a charge/event indicator, which glows in red or green depending on the charge status and blinks whenever there's something that requires your attention. Below the screen, there are three tiny dots marking the three capacitive keys (Back, Home and Menu). The actual icons are within the transparent strip, so you might be fooled to try and push those instead (like we did) and it takes a while to get used to the correct position of the keys. What's more, they've been tweaked to require a proper press rather than a light touch so it feels awkward in the beginning. The transparent strip has a cool white backlight, which makes it an attractive design accent in the dark. A fusion of form and function, this strip also holds the antenna. A closer look will show you the almost invisible grid inlayed in the transparent plastic that transfers the signal. The two wired ports - microUSB and microHDMI - are on the sides of the phone. Both are hidden under plastic flaps to keep dust away. The right side of the Sony Xperia SL holds a couple of other controls too - a volume rocker and a shutter key. We were hoping that the Xperia SL will address our complaints about the camera key, but we are in no luck. The thing is the button is thin and has a low profile, and while it's easy to press, the stop between half-press and full-press can be hard to feel sometimes. On the other hand, an imperfect camera key is still better than no camera key at all, so we'd like to give Sony a pat on the back for including it. Not only does it allow you to launch the camera instantly, but it also greatly improves usability, despite the flaws in this implementation. The Power/Lock key and the 3.5mm audio jack are on the top. The audio jack is left uncovered, but that's usually the case with these and it makes sense since it will probably see plenty of use. There's nothing of interest at the bottom besides the lanyard eyelet and the microphone pinhole. The back cover of the Xperia SL is made of soft matte plastic, which feels good and hides fingerprints well. Here we find the 12MP camera lens, located very near the top edge. This means you'll have to be extra careful not to put a finger over it when taking a photo. The camera is accompanied by a single-LED flash and the secondary microphone used when shooting video. The loudspeaker grille is also here. Removing the back cover doesn't reveal much - you'll find the microSIM card here, but you don't get to see the battery. What you would find is an aluminum frame painted black. The battery is a 1750 mAh unit, which is said to provide about 420 hours of 3G stand-by 8 hours and 30 minutes of 3G talk time. 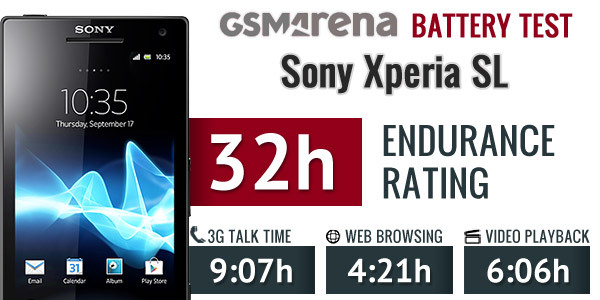 The Endurance rating of the Xperia SL is 32 hours, meaning you can talk for an hour, browse the web another hour and play and hour of video a day and you'd have to charge the Xperia SL once every 32 hours. The screen on the Sony Xperia SL is certainly one of the smartphone's highlights. It's mesmerizingly sharp, with punchy colors and very good contrast, backed by the mobile BRAVIA engine. The fact that the Xperia SL display is one of the most pixel-dense on the market at 342ppi also helps a great deal. Its only downside (and it's not a minor one) is the poor viewing angles. Anyway, the Xperia SL screen has decent blacks and even though its brightness isn't impressive, it still managed to get a good score in our test. Sunlight legibility of the screen also turned out pretty good. You can find more information on our display tests here. 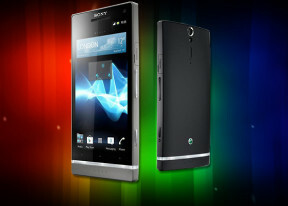 We liked the clean design of the Sony Xperia SL. The transparent strip is a unique accent and subtle enough (the Xperia pureness must be glad a small part of it lives on). The curved back fits nicely in the hand, and despite the fact it adds some extra thickness, the Xperia SL is still fairly compact and pocketable. One-handed operation is almost always possible, too.